Victoria, Mahe (Seychelles) – July 16, 2017 (travelindex.com) – The discussion in last week’s tourism report regarding the proposed ring-road from Anse Lazio to Mont Plaisir on Praslin sparked a lot of outrage and support for the Talma family. Other feedback from last week’s Issue consisted of more shared stories of the struggles being experienced and encountered by those involved in the tourism industry of Seychelles. In particular, the question of staffing generated quite a reaction. Debates around the issue of expatriate employees in Seychelles tends to polarise the public. It cannot be denied that the curtailing of expatriate staffing will inevitably impact the standard of service and also the success of many licensed operations in the field. As a Nation so dependent on tourism, we cannot afford to taint the tourism industry with political agendas. Others wrote in to share their concerns regarding the potential introduction of fast food chains in our humble town of Victoria. Many wondered who was behind this ambitious venture. We sympathise with the traditional takeaway operators who work hard to keep Seychellois traditional cuisine alive, and whose livelihoods would undoubtedly be threatened by the arrival of the flashy neon lights. Some readers raised their qualms about the costs involved in construction on the islands of Praslin and La Digue. The cost to dock to offload construction material needs to be re-examined by the relevant authorities because it is passed on to the Diguois. It is said that on La Digue SCR30,000 is payable per day for a landing craft carrying building materials docked next to the fuel station. This cost is exorbitant for the men and women trying to repair their homes or to build a little establishment for their family’s livelihood. This is a real concern for those living on these islands, and it is something which needs to be addressed. The Seychelles Tourism Board met recently and discussed the way forward for tourism. Their forecast is brave, but they know, as we all know, that they remain highly dependent on visibility, which is key for Seychelles as a tourism destination to continue to remain relevant. Press coverage does not happen by itself; it requires work and dedication by those responsible for putting Seychelles on the map. Now that the catalyst for bringing considerable press coverage to Seychelles for the past six years, the annual Carnival, has been discontinued, the trade appears to be blindly hoping for a miracle. The Saint Ange Consultancy is proud to announce that we will be branching into Environmental Consultancies. The Seychelles, like other small island states rely heavily on tourism, which remains the main pillar of our economy. If we were to ask the many visitors that flock to island destinations like Seychelles the reason they chose to holiday in these parts, the majority would say ‘to admire the rich natural beauty which surrounds’. Therefore, it is clear that the environmental wellbeing of small island nations remain crucial to the tourism industry. Ameer Ebrahim, a Seychellois Marine Scientist and current PhD Candidate with the University of Queensland, has been selected to deal with any Environmental queries that may reach Saint Ange Consultancy. Ameer has previously worked with the City Council in Australia in developing a mangrove rehabilitation project, and has gained valuable experience in mangrove rehabilitation and protection. Furthermore, he has worked alongside Australia’s leading shark scientist, Dr. Jonathan Werry, for a period of two years, gaining insights into shark morphometrics, tagging, DNA sampling and monitoring. Locally, Ameer has completed some major consultancies in the recent past. He was part of the Consultancy team that drafted the National Protected Areas Act byelaws and regulations for the Seychelles Government. He is also working with a team of scientists in developing fish monitoring baselines and training of island staff at four protected Outer Islands of the Seychelles. Bambous River Lodge is located on the banks of the Bambous river, situated at Mount Simpson Bel Ombre, on the north coast of the main island of Mahé. This very private and quaint Lodge is situated close to Marie Laure beach and is just a few minutes’ walk from the extremely popular and world-famous Beau Vallon Beach, boasting the white sands and turquoise blue water of the Indian Ocean. The Seychelles International Airport is situated at approximately 13 kilometres or 8 miles from their location. This newly-built establishment features seven spacious luxury holiday apartments. All units are equipped with a fully fitted kitchen, living space and a private veranda. Bedrooms are all fitted with air-conditioning and a ceiling fan. Each bedroom has its own en-suite bathroom comprising of a large glass shower enclosure, water closet and wash-hand basin. All bedrooms have a built-in wardrobe, with a built-in digital wall safe, and a 32″ flat-screen TV. In addition, the establishment offers free Wifi. Guests can enjoy sun bathing in the privacy of their swimming pool, relaxing in the charming gazebo area and grilling fish on the Barbeque. Joe and Maryse Pool are currently setting up a main kitchen and dining area to provide an English breakfast on request in the near future. Bertine AhKon is the proud owner of Villa Authentique, the 18-room complex at Anse Reunion, La Digue, and has recently retaken management control of the property. During my visit to La Digue Island last week, I was privileged to see members of the AhKon family hard at work, striving to ensure that their personal touch was evident throughout the establishment. “Villa Authentique is a guest house that captures perfectly all the ingredients of la Digue’s unique way of life and proposes a memorable fusion of exceptional nature, heartfelt hospitality and touch of true Creole culture” Bertine AhKon says in her brochure before adding that Villa Authentique is nestled in its very own private corner of one of Seychelles’ modest traditional islands, the timeless La Digue Island. Recognising a tourism operator who has been faithful to the industry is always important. William Rose is one such Seychellois who started small and grew to become a loyal and integral part of the Seychelles Tourism Industry. Punctuality has been the guiding principle set by William Rose from day one. His boats are all clean and crewed by professional and very attentive Seychellois. The Cat Rose ferries are today an integral part of Seychelles tourism and he is seen as an important part of the tourism chain. Tour Operators set many an itinerary based on the William Rose ferry schedule and day excursions in Seychelles programmed by the local DMCs rely a lot on the professionalism and punctuality of the Cat Rose Ferry Service. He has today added small, purpose-built fast cats, which were made in Australia, as well as a locally manufactured schooner, ‘Curieuse’, to his fleet. Through the new service, guests can either submit an offer by going directly to “Book” option and selecting “Upgrade Flight” or, upon receiving email notification about the potential availability of Business Class seats seven days before departure, directing them to a special page on the Air Seychelles website, where they can place a bid for an upgrade on each leg of their flight, provided the guest’s email address had been included in their booking. Selection criteria will take into account the bid amount as well as other criteria, including the amount of seats available in Business and the number of bids that have already been placed. Winners are notified of success 24 hours prior to the flight and the winner’s credit card on file will be charged with the corresponding amount and will receive an updated e-ticket. If the bid is not accepted, passengers will fly in Economy Class as planned and will not incur any additional cost. Roy Kinnear, Chief Executive Officer of Air Seychelles, said, “We are excited about the launch of HMUpgrade, which provides travellers with a fantastic opportunity to treat themselves to a Business Class upgrade. From completely lie-flat seats that let you sleep in comfort on our Airbus A330 aircraft to à la carte menus, priority boarding and check-in, and access to our airport lounges, our Business Class offers many reasons to sample its service. Réunion Tourisme (IRT) and the Réunion Région published their achievements in terms of visitor arrivals. As a whole, Reunion Tourism has performed well and confirmed that the consolidation started in 2015. Willy Etheve, the Director of IRT (Reunion Tourism), said at the tourism briefing that in 2016 Reunion received 458 261 tourists, an increase of 7,5 % over 2015. On his part Didier Robert, the President of the Reunion Region said that the decrease in visitor numbers in 2012, 2013 and 2014 now seemed very far, and noted that it was pleasing to see the tourism results today because it was validation that his actions and drive was working. For Reunion Island, the visitor arrival numbers are interesting as they show a real bounce back from the three previous years. 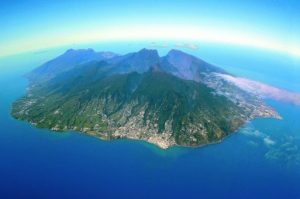 Reunion Island is also set to grow cruise ship tourism with an objective announced by Pascal Viroleau, the CEO of the Vanilla islands, to reach 50,000 passengers by 2020.